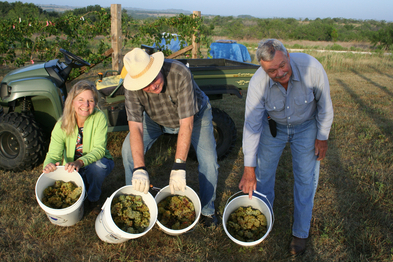 Red Wing Dove Vineyard was conceived in Plano Texas with Pinot Blanc and Shiraz vines thriving in the back yard. The small Inca dove was the inspiration for the name from the cinnamon red color underside of the wings which can be observed during flight hence the name “Red Wing Dove”. Discussing plans for retirement led to the proposition of a vineyard. 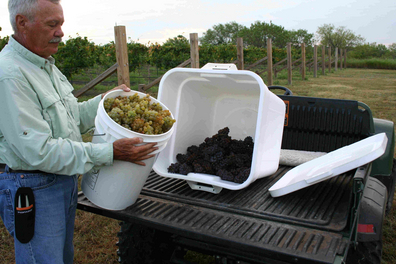 Approximately eighty acres of land for the vineyard was purchased in July 2004 in Hamilton County which incidentally is the Dove Capital of Texas. exposure of the vines orientated in north-south positioned rows. After installation of the road, electricity, water well, and a 40x60 metal building over more than a year; the trellis and irrigation system was designed, built, installed and the vines transferred from the backyard to their new home. The Vandiver single sided, double cordon trellis system is an optimized design for our hot Texas climate. Two cordons, from the main trunk on which all leaves and canes are removed, are directed toward the north with one cordon on a lower wire and one cordon on an upper wire about 4' apart. This arrangement provides 1) good airflow from the usual southerly wind flow, 2) reduced heat buildup inside the canopy, and 3) also help in maintaining attachment of the vines to the trellis wire. In hot climate it is important for leaves to have direct sun and grapes to be primarily shaded with some minimal amount of dappled sunlight. Winter pruning is performed with the objective of having the grapes grown on the top cordon on the east side, thus receiving the cooler morning sun. The lower cordon is pruned so that the grapes will grow on the western side of the trellis such that they have additional shade from the upper canopy and receive the hot afternoon sun. The Vandiver canopy and trellis system results in premium quality grapes at a maximum production rate (dependent on weather circumstances and critters).